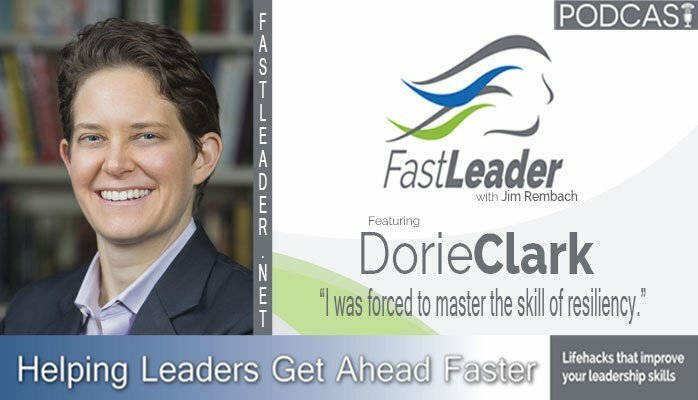 Dorie Clark found her dream job. She thought it was going to last a lifetime. It lasted for only a year. As a journalist, the entire industry contracted and she had to adjust. Dorie was forced to master the skill of resiliency and it led her to write her first book about career reinvention and how to adapt to career change. Listen as Dorie shares how she was able to get over the hump…and help others. Dorie was born and raised in Pinehurst, North Carolina, the golf capital of the world. An only child in what was essentially a small-town retirement community, she sought to escape this cultural void as soon as possible, so at age 14, she left to attend Mary Baldwin College, and later transferred to Smith College. She graduated Phi Beta Kappa at age 18, and then earned her Master of Theological Studies from Harvard Divinity School at age 20. After failing to get into any of the doctoral programs she applied to, she became a political journalist, and was then laid off. She then went to work for a gubernatorial campaign and a presidential campaign, which both lost. She finally ended her losing streak by becoming the executive director of a bicycling advocacy nonprofit, which taught her how to run a business. In 2006, she launched her own marketing strategy consulting firm. Today, she writes (her two books are Reinventing You and Stand Out), and consults and speaks professionally for clients including Google, Yale University, and the World Bank. She also teaches for the Duke University Fuqua School of Business, and is a producer of a Grammy winning jazz album. Today, she’s proud that her work helps talented professionals get their true value recognized so they can share their best ideas with the world. She lives in New York City with her handsome cats, Heath and Phillip. Look to develop ways to generate multiple streams of income. I’m a bit of a micro-manager. I need to work on delegating more. Do not pay for an office. Forcing myself to do things that I do not want to do. Schedule Once, a calendar software that cuts out the back and forth on when to meet. Stand Out 42-page Self-assessment Workbook: Learn how to develop your own breakthrough ideas and build a following around them.